I'm back after a two-week stint of travel (yes, again) and recovery from said travel. Sometimes it takes me a couple of days to recover, but coming off a cruise where I got no sleep and turning right around for a family visit up north for four days where I got no sleep left me pretty much fried. So I spent the past week sleeping and reading. A vacation from my vacations, so to speak. 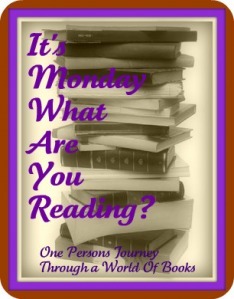 This meme is hosted by Sheila, at One Person's Journey Through A World of Books. Every week (okay, not last week because I was asleep pretty much all of last Monday) I offer my thanks to Sheila for hosting this. Today is no exception -- thank you! ...and whatever else pops up from the TBR pile. so that's it -- the unreviewed books will be reviewed shortly. Alice in Eonderland md Philosophy sounds interesting. My post is up! Thanks for your comments. I love traveling, but I've basically been on the go since December and need a break. Sadly, there's lots of travel on the horizon. I am behind on reviews too. Have fun with Alice and wonderland and Philosophy. I have the Magician on my TBR list for the Once Upon a Time challenge. I started it once but stopped reading it and never went back to it. not familiar with some of the other titles. Have to check them out. Have a great week. Jennifer: Thanks! I'll definitely come by and check out your blog. Maybe tomorrow, but I'll be there. Jan: The Magicians is okay, not great. Bobbie: Started Alice I Have Been & just couldn't get into it. I like really punchy fiction. Brooke: Thanks for stopping by! Your week sounds heavy! I don't know if I'll ever bring myself to read anything by Cormac McCarthy, I've read snippets and it's so harsh! Intereting idea to read books that became movies next month. Enjoy! And I hope you get some rest this week!